We’ll be there. And we’ll be celebrating. Brigitte Heitland’s – Zen Chic’s – new collection is Flow – it’s gorgeous. And it coordinates beautifully, perfectly and gloriously with For You, the collection that shipped in August. What’s left to do? Binding. Binding. Binding. And packing. What will you be doing on Monday and Tuesday? Laundry, buying dog food – for Frasier and Bella – getting groceries for the humans in the household and packing. And some binding. And when do you fly to Houston? Thursday! The schedule is to arrive, set up our space in the Designer Studio, finish bindings and get some Mexican food! 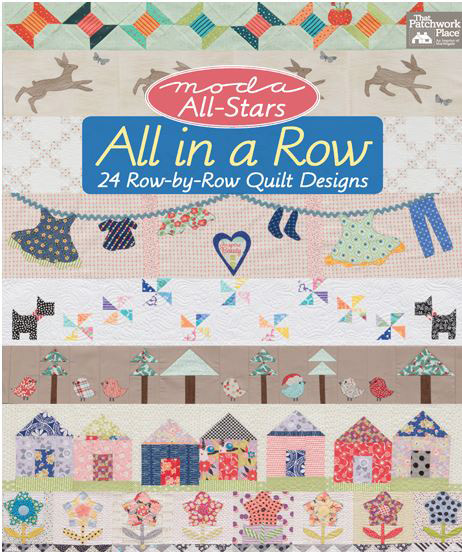 Barb and Mary will be walking the aisle for the Moda All-Stars All in a Row Schoolhouse – Friday afternoon. Coming in December, this book features twenty-four original rows measuring 48″ wide by no more than 10″ high. 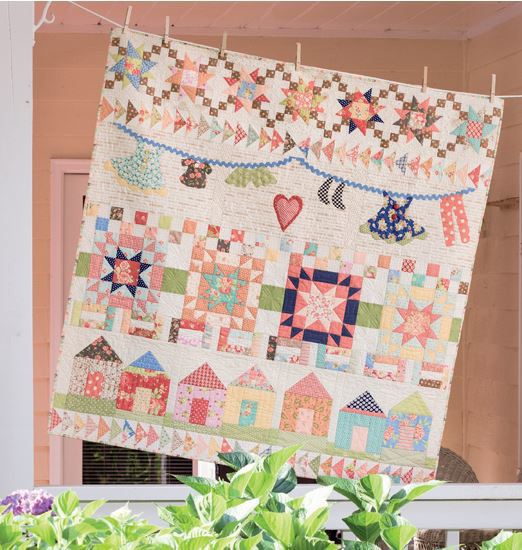 The rows can be used individually to make table-runners and wall-hangings, or combined with filler-rows to make quilts of any size. It’s published by Martingale and the “author” is ModaLissa – Lissa Alexander. Rumor has it that there is going to be some kind of pageant involved. The last thing for today is a sneak-peek of sorts. 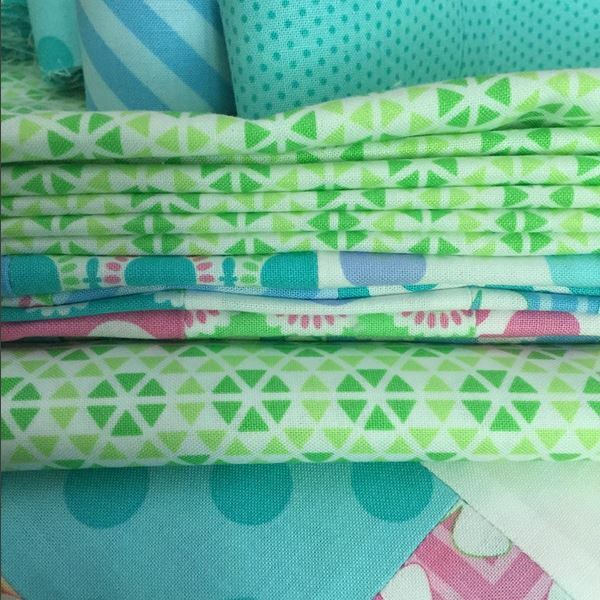 Quilt Market means new fabric collections debuting so… here’s a little taste of what’s coming. 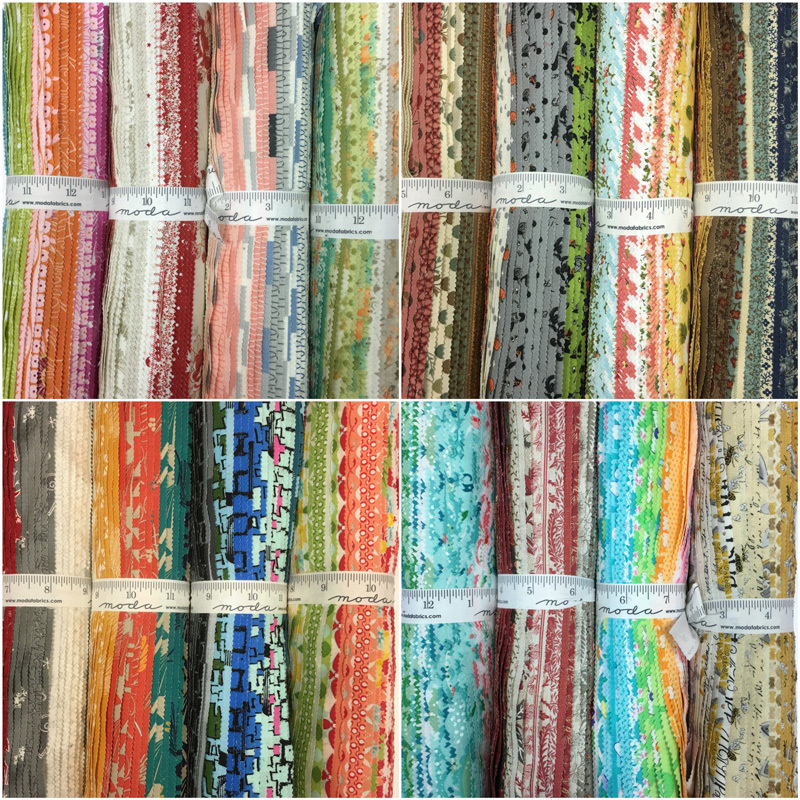 And there’s more… fabric coming. That’s it for today – I have to finish a binding, do some packing and I think I have a hair appointment. I’d better have a hair appointment. Rumor has it I might be a blonde at Market… if only for a little while. Oh I love hearing about market! And that book looks fantastic! Must figure a way to get one of those! One of these years I shall make my way to join you for all the fun! Have a great market Carrie! P.s I love the way you write, you always make me smile! Looking forward to all the updates from Market! Have fun! 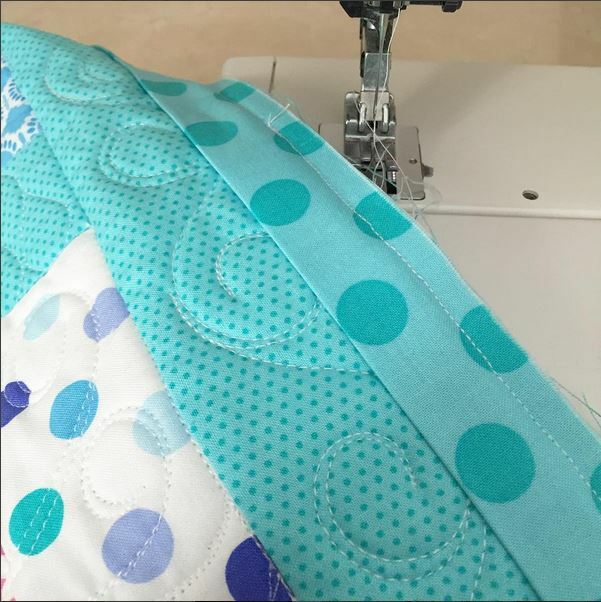 So excited about the new fabric lines! Looking forward to a fabulous market. 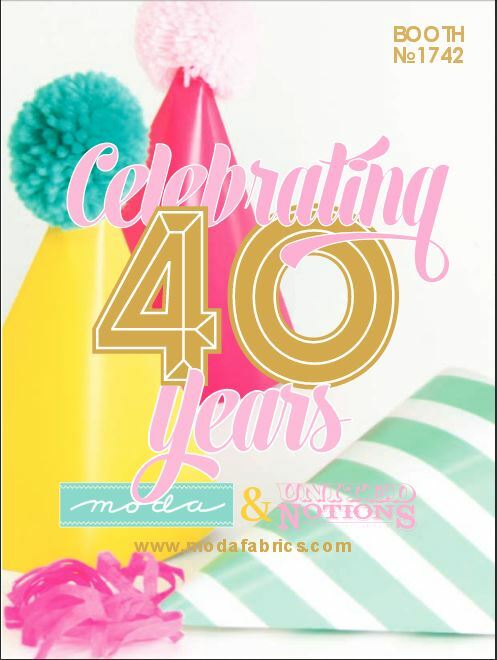 Congratulations to Moda/United Notions on 40 fabulous years. See you in about 96 hours. Congrats to Moda Lisa on her new book! I can’t wait to get my hands on it! Oh have fun so wish I was there but things just didn’t allow it this year!! WOW! 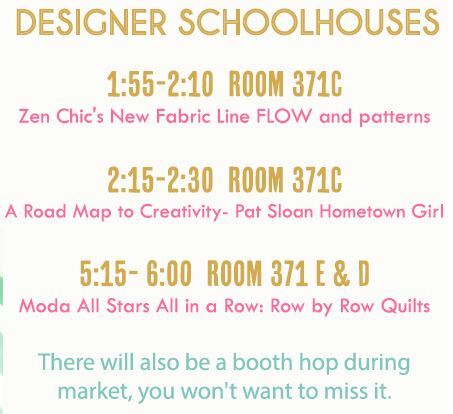 eager to see the Market Photos+new fabric collections! Congratulations and more to come.Have fun at Market and please share pics! Congratulations.Have fun at Market and please share pics!! Mostly Retired and MISS MARKET so much….Hmmm Ms. Market sounds like a fabric line to me! That pink and grey fabric looks pretty nice: wish I was going to be there!! Have fun! !